Searching “productivity techniques” on Google is a study in how to write captivating headlines. Honestly, the amount of ways people have come up with to say the same thing amazes me. I guess you can’t expect a post to succeed if you just name it “A list of productivity techniques”. The Internet has brought us a never-ending stream of useful tips, BUT, there is such a thing as information overload. I don’t know about you, but when I’m faced with all of these search results, I just start to shut down. Instead of feeling inspired, the thought of scrutinizing every aspect of my life to save more time just makes me want to crawl into bed. This is actually something I’ve been pondering a lot recently, as I tend to have an “all-or-nothing” attitude. Like, either this aspect of my life is 100% organized and efficient or why would I even bother trying to improve it a little. Can you relate? An example to illustrate this: Let’s say you want to get into a morning routine. You start looking at morning routines on YouTube and Pinterest and all of these 11-step “perfect” routines that will “transform you into a morning person” are starting to stress you out, quite frankly. Heck, your entire life, you’ve just been rolling out of bed, into the kitchen for a quick breakfast, and then out the door. How can you get from your point A to that pin-worthy point B without a complete overhaul? The answer is - you start simple. You do what you can. Once you’re feeling good about that, you build onto it. So I encourage you to think about that as you read about these habits of mine. Keep an open mind. 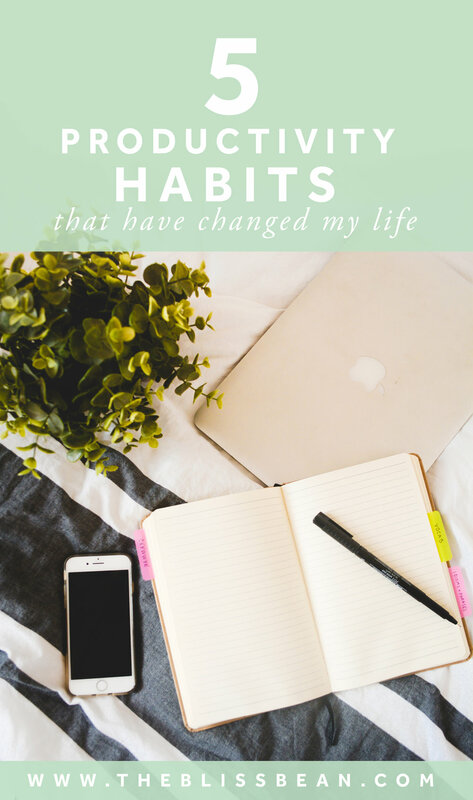 Might the habit be useful in your life? Could you incorporate it? Then why not give it a try? Get out of your own way and just try it. And on the other side of the coin, if it just doesn’t seem to fit who you are or where you are right now, just skip right over it, no worries. Nothing works for everyone. Okay let’s just get this one out of the way first. I truly don’t understand people who don’t use a planner. Do they exist? Are they magical? How do they do it? They must have computers in their brains. I’ve been consistently using a life planner since sophomore year. I graduated from using a school planner for homework to using a life planner that keeps track of eeeeverything else. My DIY planner, which has evolved slowly through the time that I’ve been using it, is truly my second brain. I don’t know how you can keep a modern-day, multifaceted life organized without some way to track your projects, tasks, and ideas, whether it’s digital or paper. The Pomodoro technique was developed by Francesco Cirillo when he was a university student. It is a way of breaking up your day into short stretches of work time to prevent fatigue. You work for 25 minutes, then take a break for 5 minutes. Repeat, then take a longer break once you’ve reached your fourth break. Do I follow this to the T? Heck no. Sometimes my breaks are shorter than 5 minutes. Sometimes I work longer than 25 minutes, because I’m totally in the flow, like when I’m editing videos. But the idea is simple, essential, and perhaps even revolutionary. Despite what we may have been conditioned to believe, breaks are NOT unproductive. They’re essential to keeping us running like a happy, efficient, well-oiled machine. I’ve found that on the days where I fall off the track of using this technique, I regret it. That evening, I’ll write in my journal that I need to stick to the Pomodoro technique better the next day, hehe. This technique has stuck with me for a long time and I’ve talked about it to my parents, to my friends, on my blog, even in my school newspaper, hehe. It’s time EVERYONE acknowledges the value of breaks. You may have seen the video that I uploaded just yesterday that is allll about this (if you haven’t, please do, because I’m insanely proud of how it turned out). Basically, time tracking is tracking what you do during the day and how long it takes you to do it. You can do it on paper, in a spreadsheet, or using the app. I prefer the latter. Simplicity and speed FTW. The data you gather reveals insights into how you spend your time, which can oftentimes be quite surprising. I’ve been doing it for nearly a year now and it has become so ingrained in me, I instinctively open the app even when I’m on vacation. I value my time so much more now that I have to record how I spend every minute. I’m more aware of how much time I waste on distractions, and how much time I invest into things that are actually important. It’s really not as hard as it might sound. All this talk of “data” and “insights” is deceiving. Really, all you do is press a button whenever you switch to a new task. If it still sounds like a lot, I encourage you to try it for at least a day, even if just to see how impossibly quickly social media makes the minutes tick by (it’s scary). I started doing this for the last few months of my junior year and even though it was a lofty goal that I didn’t reach every single week, I achieved it enough times to see that it really made a positive difference. I wanted to get all of my homework done during the week because I wanted to clearly divide my week between school and other important things. I wanted to minimize the amount of time I spent switching between school and extracurriculars and blogging so that I could be more focused in everything I did. My routines serve two purposes. From a more practical standpoint, they keep me organized. I look through my planner in the morning to add any tasks I forgot about and to create a plan of action. In the evening, I make sure I checked off the appropriate items and I move things to the next day, if needed. That’s a killer combo. The second purpose is to take care of myself mentally. I stretch and journal before bed and once I wake up. I make it a priority to have a peaceful, calm morning and evening because I know that no matter how busy I am, returning to my routines will ground me and ensure that I don’t run myself into the ground. If you need some help figuring out your own morning and bedtime routines, check out my "Build Your Own Bedtime Routine" post and grab the free worksheet! I have a question for you - are you a paper or digital person? Feel free to explain all of the nuances of your organizational system in the comments, haha (for real, I love talking about this stuff).